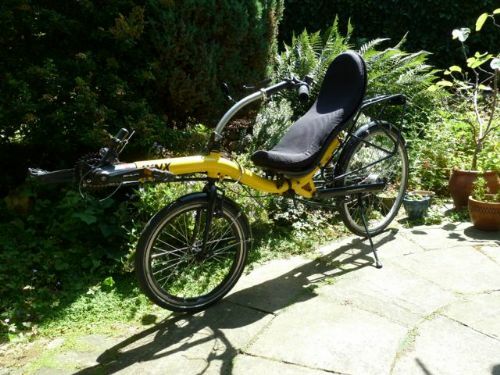 For sale: Optima Lynxx, medium sized frame. £490. Buyer collects from Nottingham or pays delivery. Set up for inside leg length 75 cm. Converted to hub gears. Very good condition. what is the maximum length adjustment on this machine? Is it still on sale? Yes the Lynx is still for sale. I'll have a look at the boom this evening to check for adjustment levels. I've extended the boom by 105 mm. That was the furthest I could move it with the chain still going through the changer, on which it was catching. At that boom length, the straight-line distance from the very front of the frame to the bolt underneath the seat was 875 mm. Before the adjustment it was 775 mm. Thanks for the update. I have a 31 inch inside leg so I think that it would work for me. I am abroad at the moment. I will be back in the first week in August. Perhaps I could come up to Nottingham to have a look at it sometime mid August? Yes, that would be fine. Let me know when you can get to Nottingham. I'm the 2nd owner. I bought the bike from someone in Ireland (a BHPC member) in 2005 or 2006. He said he had bought it new for his wife who didn't take to it, so he sold it on fairly new. The gears never seemed right, so I rode it very little and made the decision to fit a new Sturmey Archer 8-speed hub, for which I had a wheel built. 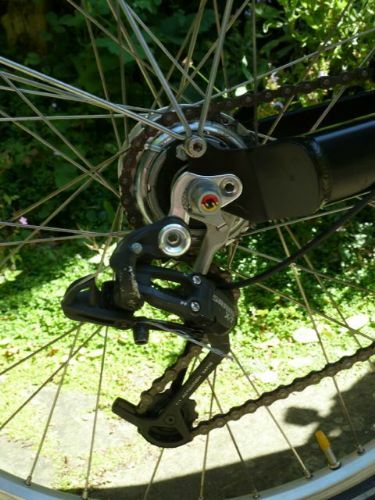 Finally, Dave at Laid Back Bikes in Edinburgh added the correct 2nd hand chain tensioner so that the setup worked, by which point it was time for me to move to Nottingham, where the bike has sat in the basement unused. It is not the right bike for my current commute, and I'd been hanging on to it in case I move somewhere flatter, with less bike thieves, but my contract has just been extended here, so it's time to sell, and find a bike that I will ride more. It has spent 99.99999% of its time in storage, so I reckon to have done less than 200 miles on it. If you have further queries, then please let me know.